Professionally design and manufacture 1~3 color screen printing and film covering machine, Large flat sheet screen printing & film laminating equipment, Automatic multi color screen printing and film covering production line. 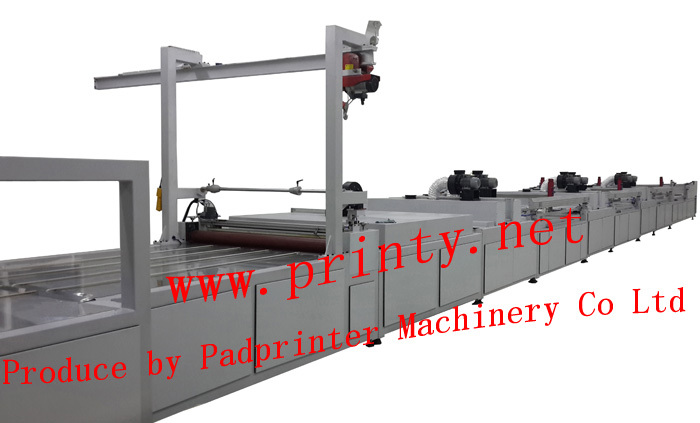 This 1~3 color screen printing and film covering machine, Large flat sheet screen printing & film laminating equipment, Automatic screen printing film covering machine is designed and tailored to the 1~3 color silk screen printing on small and large flat sheet substrate products such as metal plates, doors, advertising boards, glass sheets and similar products etc. The whole system is consist of a loading machine, 3 stations of 4-lifting-post flat vacuum screen printing machines, 3 stations of UV curing machines, film covering machine and unloading coveyor etc. Reasonable structure, accurate and stable on multi color screen printing and film covering performance. With 0~30mm big space printing height adjustment..
Equips with automatic screen peeling facility, the screen printing structure of 4 posts synchronous lifting system can achieve better printing results.